The executable is only 12MB in size, does not require a system wide installation, but still supports most Python application and scripts. Small footprint: only about 12 MB in size. Can be compressed to just 3-4 MB using gzexe or upx. Compatible with setuptools, easy_install, pip: Great care was taken to make sure that PyRun can be used with setuptools et al. Please note that the documentation for the 1.0.0 release is not yet as complete and comprehensive as it should be. We're working on it. 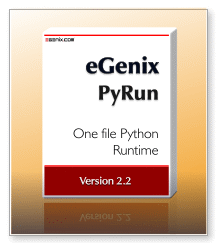 By downloading, installing or using eGenix PyRun, you agree to the terms and conditions set forth in the eGenix.com Public License Agreement 1.1.0 which is an Open Source license based on the CNRI Python license and the Python license. eGenix PyRun does not support Windows in the current release. The script also offers a few options to adjust various parameters. It uses curl to download the packages, so you need to have curl installed on your platform. If you want to build against a specific Python version, you can specify the version using the make parameter PYTHONFULLVERSION=2.7.3. Please have a look at the PyRun/Makefile for more ways of customizing the setup.